Having different gauges on a railway network is a difficult challenge for planners and operators. There are a set of tools that can be used to minimize the connection problems at gauge frontiers. For HS, the solution has come through automatic gauge changing trains. For freight there are other solutions working now such as static wheel changing at frontier and third rail, but each has its disadvantages and there is need for enhancing the array of tools at the disposal of the infrastructure planners and decision makers at the transport ministry. The Spanish rail authorities have decided it is time to develop an automatic gauge changing technology for freight trains, and they have put forward a program that aims at having a certified variable gauge wheelset by the end of this year. 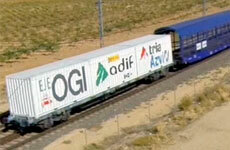 ADIF awarded the consortium formed by the Spanish companies TRIA and AZVI a contract to develop and homologate two variable gauge wheelsets for wheel diameters of 920 mm and 760 mm, that mount on Y21 bogies in the case of the 920 mm wheel and on vehicles carriages in the case of the 760 mm wheel. At this moment, the prototype train has done 20 thousand kilometres on the HS and conventional networks of the 250 thousand required for final approval. Previously, the wheelsets have passed bench tests and the gauge changing tests.